WDMA Air interface or Uu Interface contains 3 layers, WDCMA Air interface wcdma fer wcdma power control wcdma transmit power wcdma signal to interference ratio. WDMA Air interface or Uu Interface contains 3 layers which describe as follow, The WCDMA layer 1 supports all functions required for the transmission of bit streams on the physical medium. It is also in charge of measurements function consisting in indicating to higher layers, for example, WCDMA Frame Error Rate (FER), WCDMA Signal to Interference Ratio (SIR), WCDMA interference power, WCDMA transmit power, it is basically composed of a “layer 1 management” entity, a “WCDMA transport channel” entity, and a “WCDMA physical channel” entity. The WCDMA layer 2 protocol is responsible for providing functions such as mapping, ciphering, retransmission and segmentation. It is made of four sub layers, MAC (Medium Access Control), RLC (Radio Link Control), PDCP (Packet Data Convergence Protocol) and BMC (Broadcast/Multicast Control). The WCDMA layer 3 is split into 2 parts: the access stratum and the non access stratum. The access stratum part is made of “WCDMA RRC (Radio Resource Control)” entity and “duplication avoidance” entity. The non access stratum part is made of CC, MM parts. 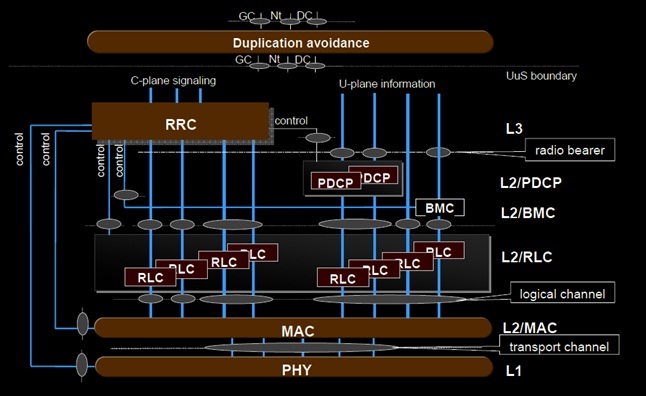 As shown on the figure are connections between WDMA RRC and all the other protocol layers (RLC, MAC, PDCP, BMC and L1), which provide local inter-layer control services. The protocol layers are located in the WCDMA UE and the peer entities are in the WCDMA NodeB or the RNC. 26 queries in 0.347 seconds.